Mozilla has just announced an entry level developer phone for Firefox OS based on a Qualcomm Snapdragon S1 processor, 512 MB RAM, and 4GB Flash. 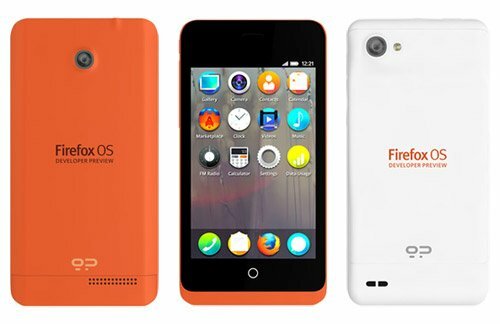 You may think the specs are quite poor, but this actually makes sense since Firefox OS is initially destined at emerging markets. The phone supports over the air updates, and comes unlocked, so you can simply add your own SIM card. These developer phones are being developed by Geeksphone in partnership with Telefonica. If you don’t have the developer phone yet, you can still get started by running Firefox OS Simulator in your desktop web browser, or install Firefox OS on your own Android 4.0 or greater smartphone. Geeksphone says there’s also a second model called the Peak which will feature a 4.3 inch, 960 x 540 pixel display, a more powerful 1.2 GHz Qualcomm Snapdragon S4 dual-core processor, an 8MB rear camera, 512MB of RAM, and an 1800 mAh battery. Both Keon and Peak preview phones should be available to developers from February. Mozilla also announced Firefox OS App Days that take place in over 20 locations around the world to promote the platform and help developers getting started with Firefox OS.